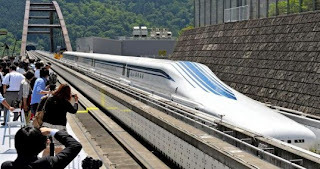 Engineers with Central Japan Railway Co. have put their newest maglev L0 train through initial testing and report the new high-speed train is on course for commercial deployment by 2027. The train will eventually carry up to 1000 passengers at a time in 16 carriages (traveling at speeds up to 311mph / 500kmph) between Tokyo and Nagoya, cutting current travel time from 90 to 40 minutes. The initial test of the train was a simple trial to ensure soundness—the lead car and four other carriages were pulled along a track using a maintenance vehicle. An official test of the train is expected to be carried out in September. The maglev train, like others of its kind, is held in the air by magnets as it's traveling cutting down on friction between wheels and rails. Japan was the first country to introduce maglev trains. They built and used one to transport spectators at speeds up to 130mph to and from venues at the 1964 Olympics held in that country. Since that time, virtually all other technically advanced countries have built so-called bullet trains and have put them into service. The title of worlds fastest is currently held by China's Shanghai maglev train—it's capable of running at speeds of up to 268mph, though it generally operates at closer to 150mph due to track length restrictions. A train running at 311mph would set a new bar, likely prompting others to see if that speed can be topped. Japan has set itself apart in high speed rail—its current network of trains run at speeds averaging a world-best 199mph over 1,400 miles of track. Nagoya, Japan's third largest city is approximately 218 miles west of Tokyo—the the span between them is currently serviced by the Tokaido Shinkansen Line. Plans call for the rail line to be extended all the way to Osaka by 2045. Government officials have indicated that the overall plan is to add high-speed service between all of the major cities on Honshu, the country's main island. When complete, each of the new trains will feature 16 carriages—plus the streamlined nose car positioned at the front. Each passenger car will be 24.3 meters in length, giving riders more room than conventional railcars, though there will be one extra seat per row.